Though Porsche's factory team has transitioned to the mid-engined 911 RSR, customers will continue to race an altogether more traditional 911. The new GT3 R shares not only its 4.0-liter water cooled flat-six with the road going GT3 RS, it also retains the rear engine layout common to all road going 911s except for the GT1. With improved aerodynamics, ergonomics and power, the new GT3 R promises to be a formidable competitor on racing circuits the world over. The 4.0-liter water-cooled flat-six is largely carried over from the road car. Rated at 550 horsepower in the GT3 R, the new engine carries over many features from the RS. Direct fuel injection provides up to 200 bar of fuel pressure, and variable valve timing is equipped on both the intake and exhaust. Compared to the outgoing engine, the new powerplant promises a broader torque curve and easier driving characteristics. Six individual throttle bodies afford improved throttle response. Rather than a 6-speed manual or PDK transmission, the GT3 R uses a 6-speed sequential transaxle. The constant-mesh transmission features an electronic actuator for fast, accurate shifting. The clutch is controlled electro-hydraulically, and starts and stops are handled automatically. 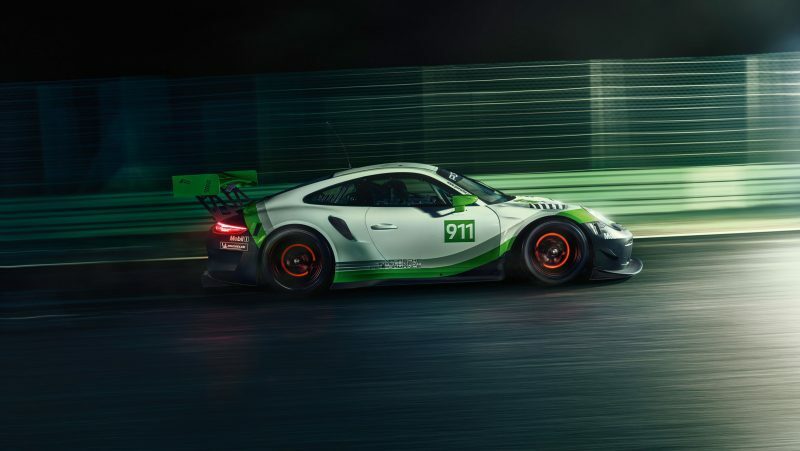 The brakes have also been updated in the latest GT3 R. The front six-piston aluminum monobloc calipers clamp down on ventilated and grooved steel brake discs measuring 390mm in diameter. The rear four piston calipers grip 370mm discs. The ABS system has been revised for more precise control under heavy braking conditions. The front suspension has been substantially updated with a new double-wishbone system. The new front suspension includes forged aluminum control arms and spherical bearings for optimal control. Setup changes can be handled via a new shim system, which permits a greater range of changes without the need for a new alignment. Front tire diameter has also been increased, aiding control and braking performance. Based on the GT3 RS road car, the GT3 R's body features aluminum-steel composite construction. The roof, front hood, faring, wheel arches, doors, side, tail and rear decklid are all made of carbon-fiber composite material. All windows are made of polycarbonate, and are designed to be removed easily in the event of an accident. Updated aerodynamics follow the trends established by the road car. The distinctive wheel arch vents are carried over, and increase downforce on the front axle. The rear wing now measures 1,900mm in width and 400mm in depth. The vehicle layout is better optimized for both the driver and the pit crew. Major cockpit controls are re-positioned for easier use by the driver. The 991.2 GT3 R is the first GT3 R to feature air conditioning, which is directly tied in to the driver's seat and helmet. These updates are expected to help the driver to maintain peak performance during lengthy endurance races. For improved safety the doors and side windows can be easily removed, and an impact element has been added to the driver's door. The seats are now secured at six points, optimizing safety and weight balance. All adjustments are now made via the adjustable steering wheel and pedal box. The 120 liter FT3 fuel cell is now equipped with two fillers, and can be refilled from the left or right side. This update simplifies pit stops for crews in all circuit layouts. The new GT3 R will cost 459,000 Euro (~$549k US at press time), and country-specific VAT will be calculated separately. All technical details and data are provisional until the final approval is received through FIA.